If you haven’t seen the five minute chocolate mug cake by now, then I don’t know where you’ve been!? My favourite version comes from the talented Lorraine at Not Quite Nigella (she also has an amazing recipe for a five minute peanut butter chocolate chip cookie… just sayin’ ). The other morning I was faced with a desire to use up some carrots and also eat a hot breakfast. Google came to the rescue with this surprising Two Minute Breakfast Carrot Cake. Breakfast? Cake? Hmmm. Combine the dry ingredients first, then add the wet ingredients and the carrots and sultanas, stirring to combine. If you want to make this a super quick breakfast you can prep all the dry ingredients and all the wet ingredients in separate bowls and store them in the fridge overnight, then throw it together in the morning. Transfer the mixture to a small microwave safe bowl or a mug (I used a ramekin)*. Microwave for 2 minutes on high**. *This recipe was enough for me to make two small single serve cakes. I had one for breakfast, Paul scoffed half of the other one and declared it “not bad” (high praise from this skeptic of my random cooking experiments) and I ate the other half for afternoon tea. **Note that microwaving times may vary. My cake was cooked well well at 1 min 30 seconds. How good does the banana ice cream look with the original recipe? Dairy free, no added sugar and looking divine. I must try that when I have some very ripe bananas (a rarity in this house). Would you try this cake? What vegies need using up at your house? Wait! Don’t go! Just because this post is all “sugar free” doesn’t mean that it won’t be sweet. I promise. Just look at these pretty tarts! Let me start at the beginning. In January this year I was feeling like crapola. I was in a holiday food coma and I needed to find a way out of it. That’s when I stumbled across two books, Sweet Poision by David Gillespie, and I Quit Sugar by Sarah Wilson*. Then I watched this. And I decided to give this sugar free gig a try. I didn’t follow any program exclusively, but mashed them together to create a version of sugar free that worked for me. I treated it as an experiment, one that I could stop anytime if I didn’t feel like it was working for me (wise advice from Sarah Wilson). That was 85 days ago. I quit sugar to kick my “addiction” to the sweet stuff. To say goodbye to the constant cravings and the NEED to eat something sweet. I was sick of being a slave to it. There are many good reasons not to eat sugar, but I’ll leave the explanations to the experts. I can say that it’s worked for me. I don’t crave sugar any more. It’s one less demon that I need to worry about. However. I like food and friends, and having food with friends. I like feeding my friends. So I have sought out some recipes to help when I need a sweet treat on the table. 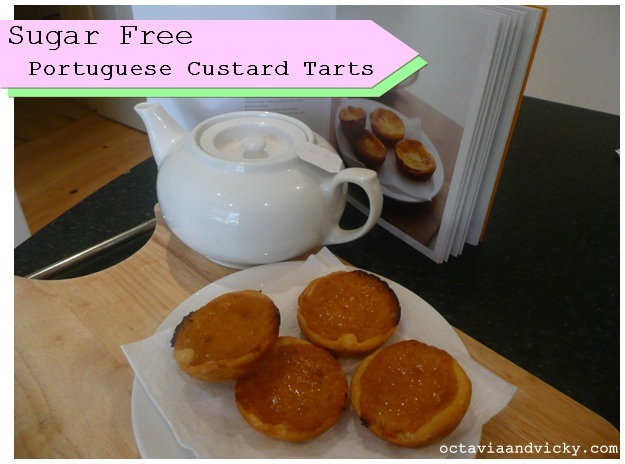 Over Easter I modified a recipe for Portuguese Custard Tarts to make it sugar free. And it worked! These are slightly citrusy from the lemon zest, and just sweet enough to hit the spot. 1. 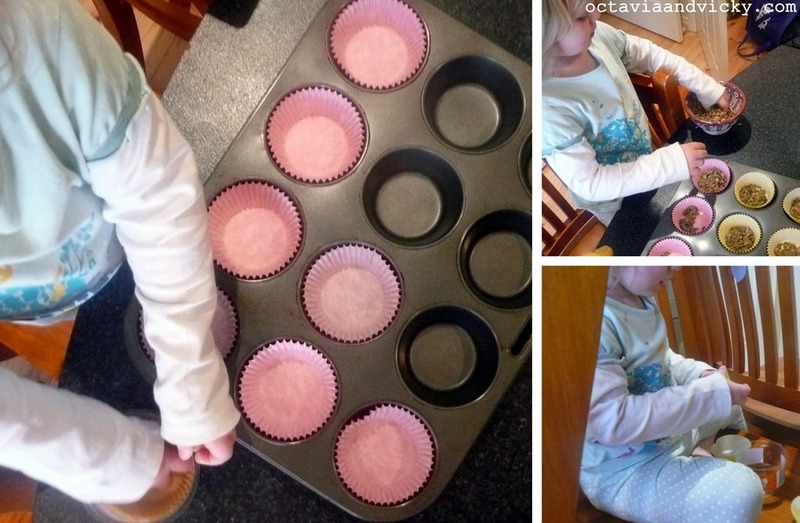 Make a chair prison for your toddler and set them up with some patty pans, a muffin tray, and some seeds or lentils to keep them busy “helping” you. 2. Preheat oven to 220C. Grease 12-hole muffin pan. NOTE: I used a tart pan for one batch and a muffin pan for the second batch. I preferred the muffin pan. 3. Whisk syrup, cornflour, egg yolks, cream and water until smooth. Add lemon rind and stir over a medium heat until mixture comes to the boil. Remove from heat, discard rind. Stir extract into custard. 4. Give the toddler her dummy, even though she’s probably too old for it and it’s not sleep time (but she’s still in her pyjamas, so close enough). 5. 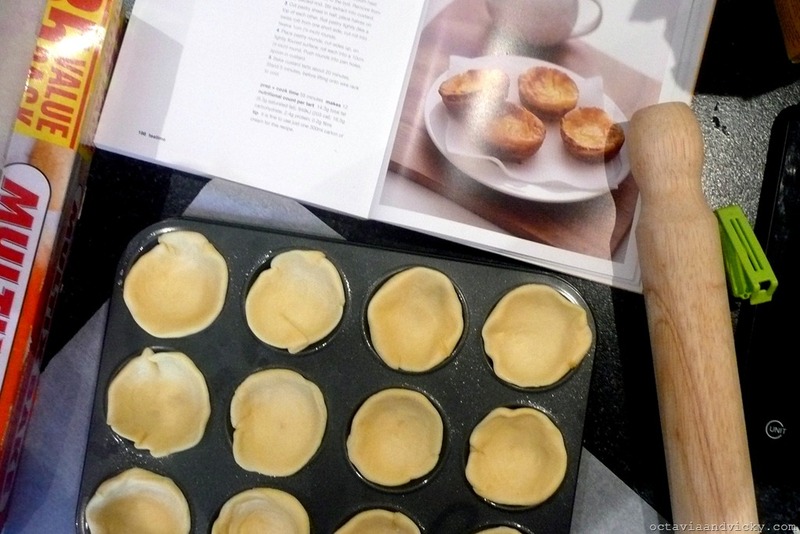 Cut pastry sheet in half. Place halves on top of each other. Roll pastry tightly (like a swiss roll) from one short side; cut roll into twelve equal rounds. 6. Give the toddler a cuddle and a promise of play in just “one more minute”. Liar. 7. Place pastry rounds, cut sides up, on lightly floured surface. Roll each into a 10cm round. Push rounds into pan holes; spoon in custard. 5. 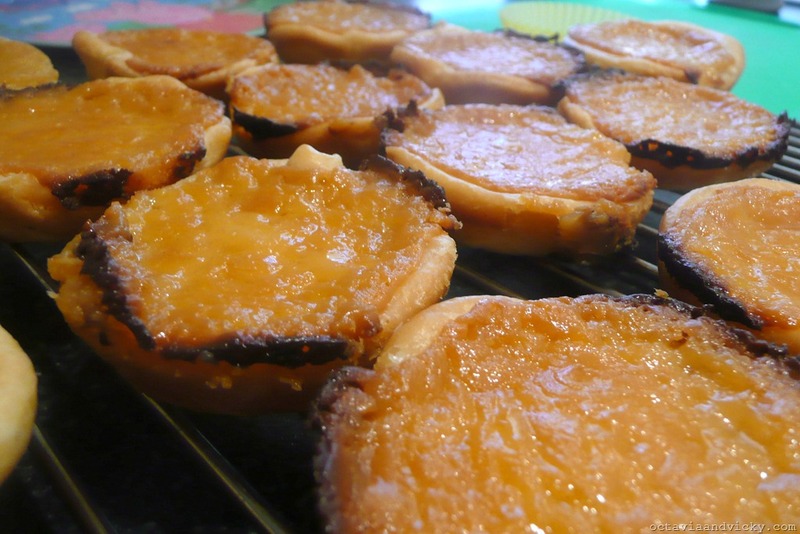 Bake custard tarts about 20 minutes. Stand 5 minutes before lifting onto wire rack to cool. 6. Go and play with the poor kid. So, what am I grateful for? ~ high backed kitchen chairs that prevent a toddler from falling when she’s standing on said chairs and “helping” me cook. ~ rice syrup, for making my sugar free life sweet. ~ patty pans and their never ending ability to divert the attention of a toddler. What are you grateful for? Join in with Maxabella and Kidspot. *Disclaimer: this is not a sponsored post.